Power VM stuck in “shutdown” state. 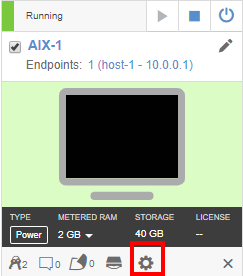 Description – If you shut down a Power A particular type of CPU that supports IBM i, AIX, and Linux in Skytap Cloud. VM from the Environment Details page before it has completed startup, it may get stuck in the “shutting down” state. Workaround – Manually shut down the OS. Click on the VM tile in the Environment Details page to connect to the Power VM using the SRA client. In the SRA client view, type shutdown, and then press Enter to shut down the AIX guest OS. Description – The Backspace and Delete keys don’t function as expected in ksh, the default shell in AIX. To use bash, from the shell, type chsh [username] bash. Description – Power VMs have no eject mechanism for an attached ISO. Workaround – Shut down the Power VM and restart it. After the VM has restarted, load a different ISO. 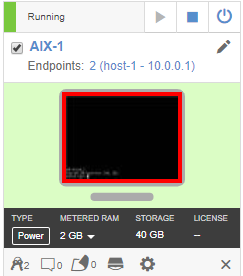 Hardware for an AIX VM can be configured incorrectly. Description – The Skytap interface lets you set VM memory to a lower value than Power VMs support. Workaround – For AIX VMs, the minimum supported memory is 2048 MB. For Linux on Power VMs, the minimum supported memory is 1024 MB. In the RAM field, type a value of 2048 or higher. Description – The shared drive is not automatically mounted to the AIX file system. Description – The virtual CD-ROM drive may not be automatically mounted to the Linux VM. Description – For older versions of the AIX VM templates, TCP/IP settings were configured by DHCP. MTU and MTU bypass settings would be deleted, which caused slow file transfers. Workaround – Download the latest version of the templates. If you are already using older versions of the templates in a test environment, you must manually configure TCP/IP settings in the guest OS to add the AIX VM to the environment network. For further assistance or to report an issue, see Skytap Support.